Although our previous map suggested that Burhakaba east of Baidoa was under government-allied control at that time, it became clear soon after publication that the city was in fact still under the control of Al Shabaab. Most of the Somali/AU offensives over the last two months have centered on the goal of opening up the road from Mogadishu to Baidoa - an effort that has currently stalled about halfway between Wanlaweyne and Burhakaba. Kenyan-led AU and Somali troops also began an advance towards Jilib in the southwest (presumably along the road from Afmadow, since Jamaame hasn't been reported captured), but have apparently not yet reached that objective either. The first major town to be taken from Al Shabaab since October is Jowhar, north of Mogadishu, which fell to Ugandan-led AU and Somali forces on Sunday. In other developments, the pro-government ASWJ militia, which was among the first to make gains against Al Shabaab nearly two years ago, has formally agreed to join the Somali federal government and integrate into the national army. This means that the areas north of Al Shabaab's territory, which have long been controlled autonomously by the ASWJ, will now theoretically fall under the jurisdiction of the national government. In practice, much of this area is still patrolled by government-allied troops from Ethiopia, who invaded last year to push Al Shabaab back from their border, though the major cities of Baidoa and Beledweyne have since been handed over to AU peacekeepers. 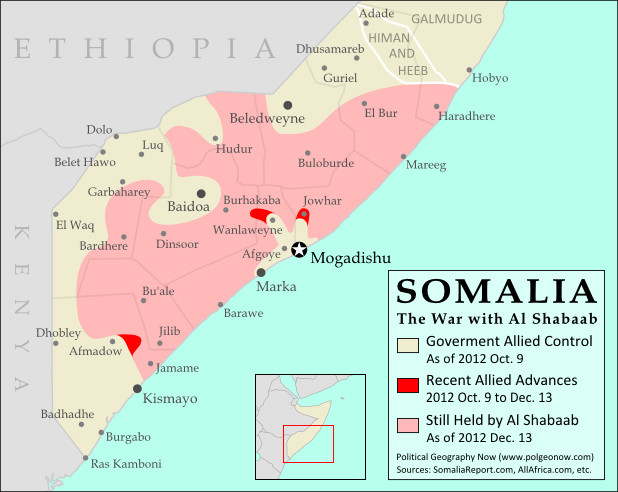 For a who's-who of the many players in Somalia's civil war, see our previous Somalia feature.